Hi friends! 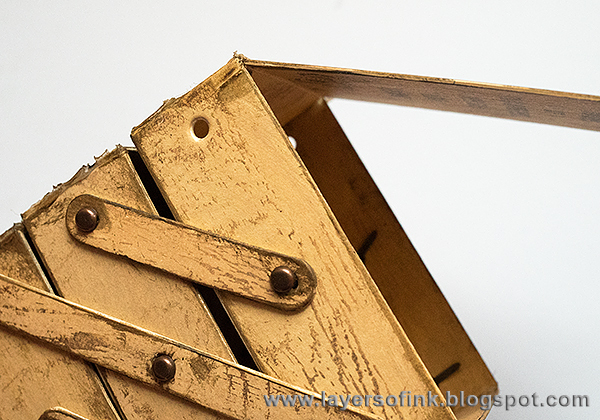 Today I am here with a Sizzix tutorial using a new die by Eileen Hull. Its a fun and easy project. 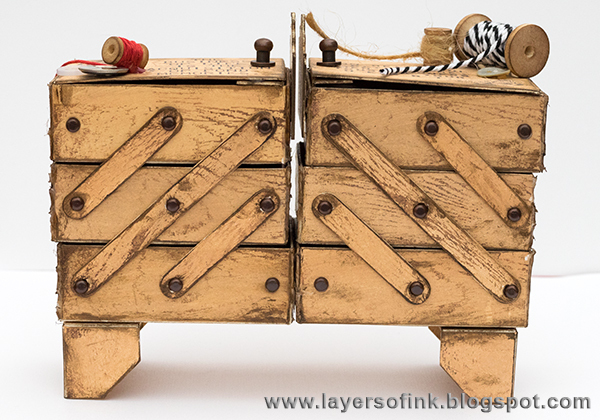 When I was a child I had two vintage sewing boxes which I treasured very much. I still have them and they are full of little treasures from my childhood; buttons, zippers, labels, scraps of fabric I got from my mom, thread, ribbons and more. 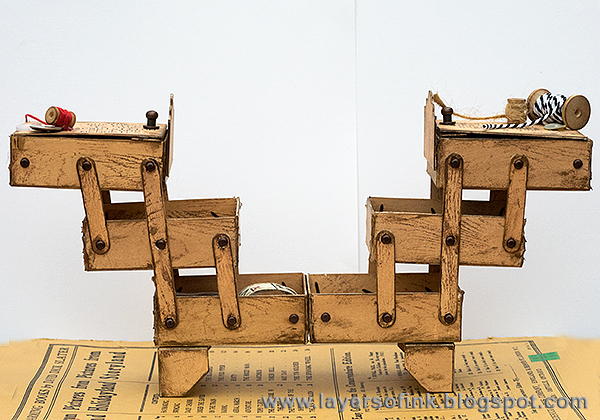 One of them is very similar to the design of Eileen Hull's Cantilever Sewing Box and I made this to mimic my own box. 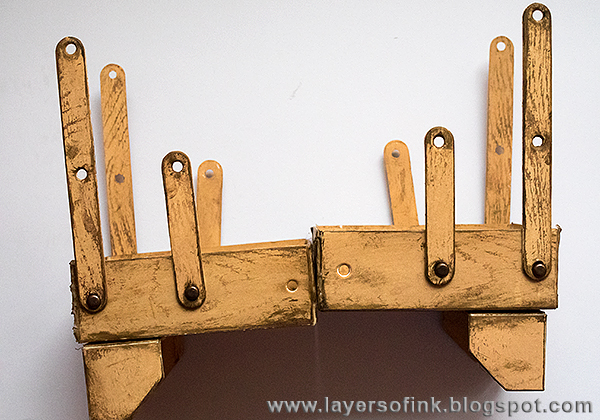 If you want a different look, you can skip the wood technique and instead use patterned paper or bright paint. Anton wants me to make a blue one for him. 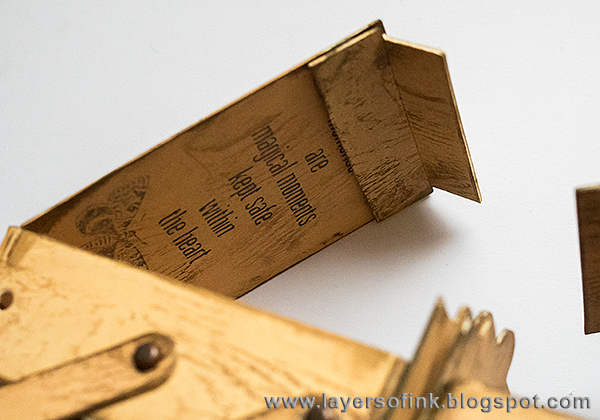 The finished size is about 6.5 x 4.5 x 2.2 in, so it is pretty big, and when you open it it is about 16 in. Here is my sewing box. It has got one layer less than the mat board version. 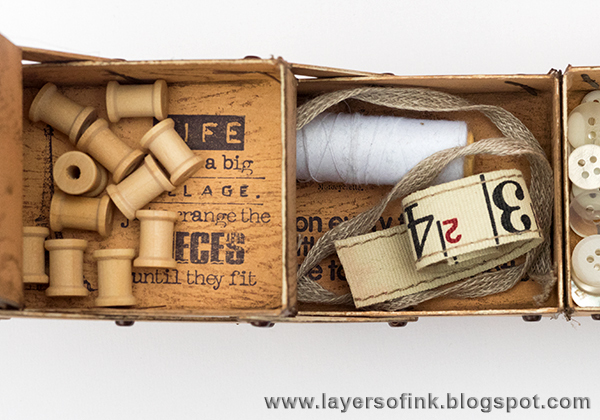 These are the pieces you need to create one sewing box. 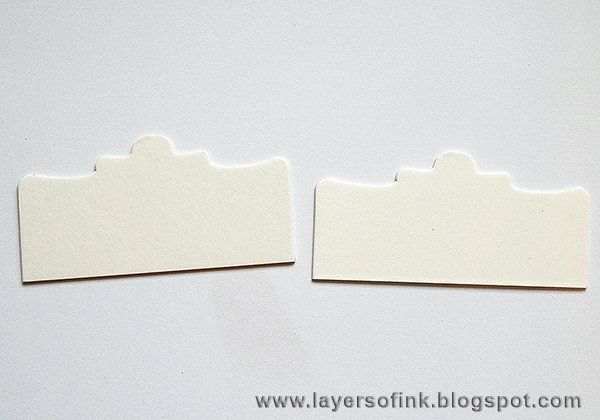 Die cut using this sandwich: Extended Cutting Pad, die facing up, mat board, second Extended Cutting Pad. 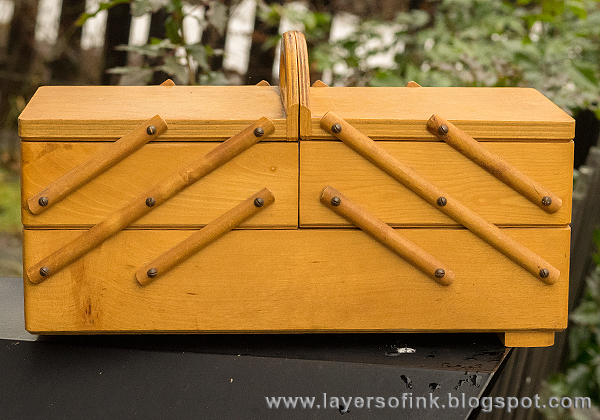 I wanted the same type of handle for my box as on my real sewing box. 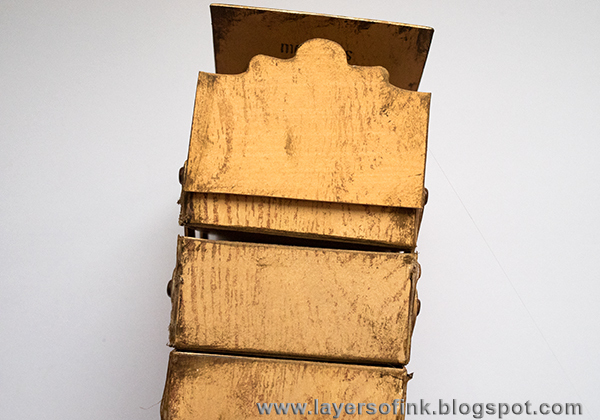 The top of the Recipe Card Box die makes a perfect ornate handle for the sewing box. Die cut two. You have to trim them a little to fit. I mixed Antique Linen, Tea Dye and Ground Espresso to get the shade of brown that I was looking for. 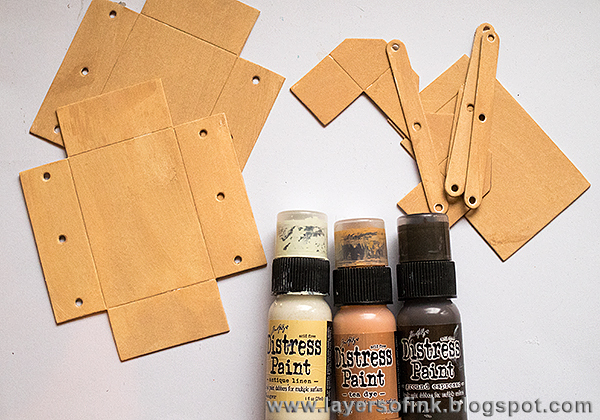 I was happy to use the Tea Dye paint, it is one of my least used Distress colours, I tend to forget about it, even though it is a really nice colour. Paint both sides. 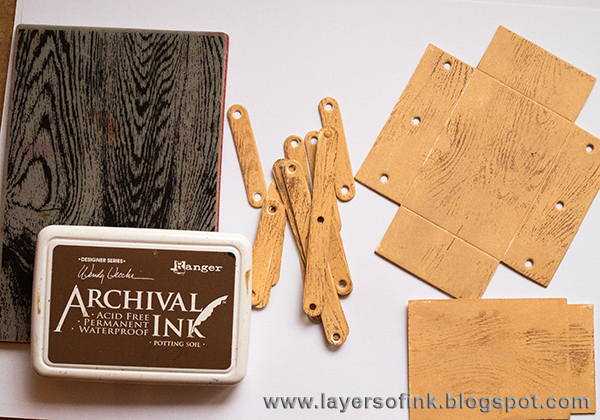 When the paint is dry, stamp randomly with a wood stamp and Potting Soil ink. 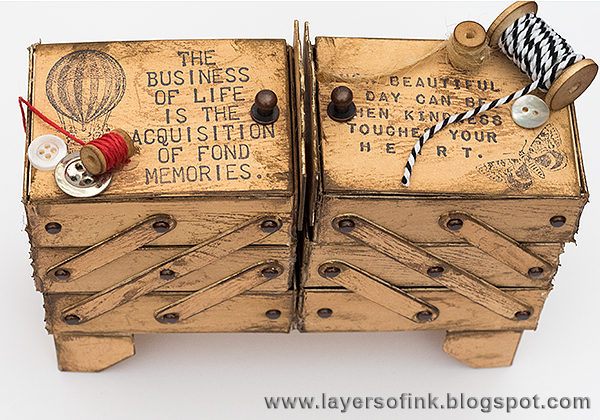 I didn't want to decorate the box much on the outside and got the idea of it being sort of a secret place for quotes and sentiments about life and dreams. 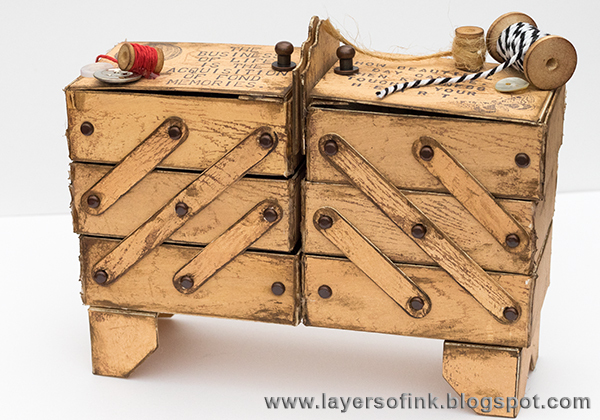 Hidden away underneath the little treasures of buttons and other items. 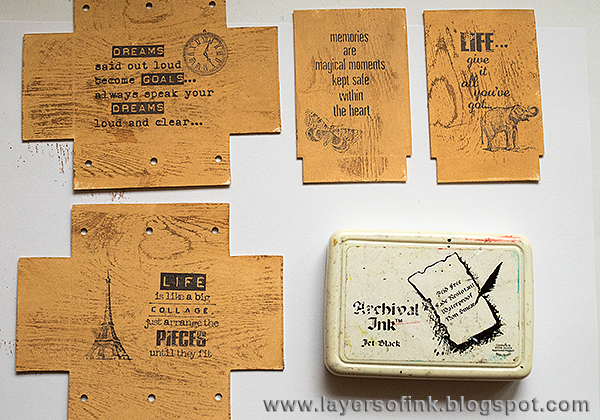 The insides were stamped with sentiments by Wendy Vecchi, and with images from Tim Holtz Tiny Things set. 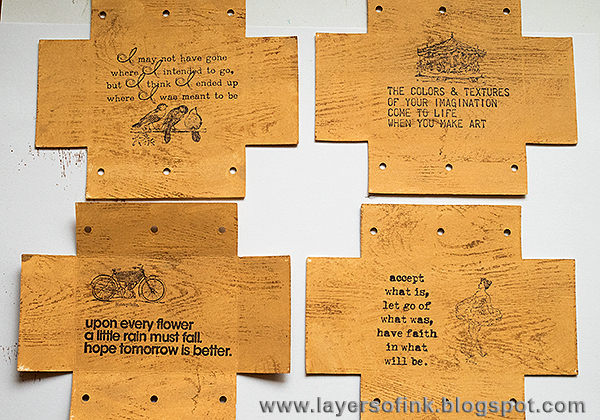 Wendy has such wonderful sentiment stamps. 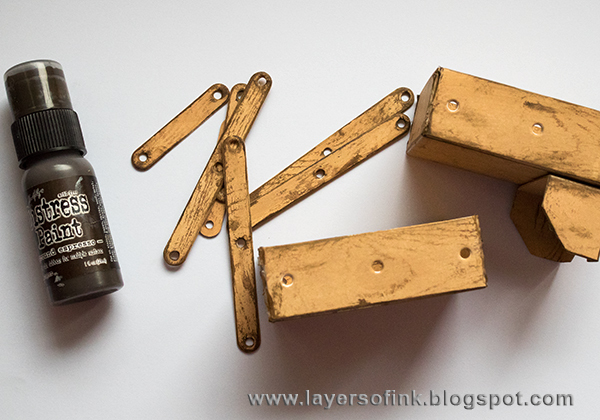 I was also inspired to use Tiny Things again after having used it on my Mosaic Pen Holder. 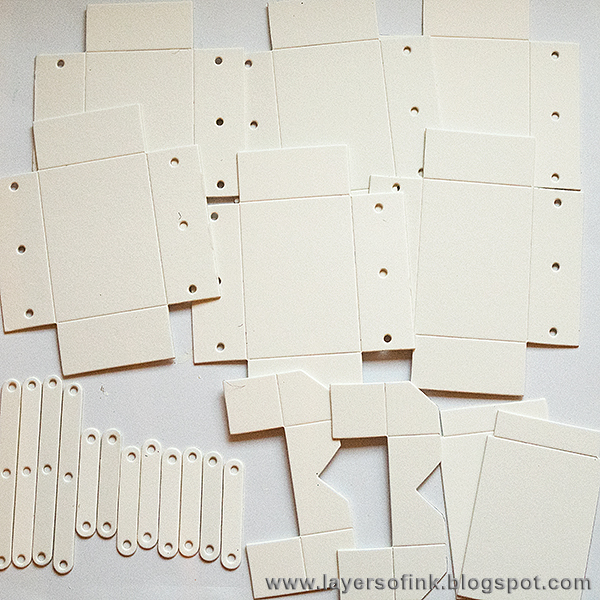 Assemble the boxes with hot glue, and be very careful not to burn yourself. Glue the feet to the bottom drawers. Dry brush Ground Espresso on all the pieces. This also hides any glue that might be showing. Place the bars as shown. I like to use a pair of pliers to carefully press the brads, so that they fit a little tighter than they otherwise would. Don't press too hard since then it will be difficult to open the box. Continue with the second drawer as shown. And finally add the third drawer. Glue the lid to the inside of the top drawers. 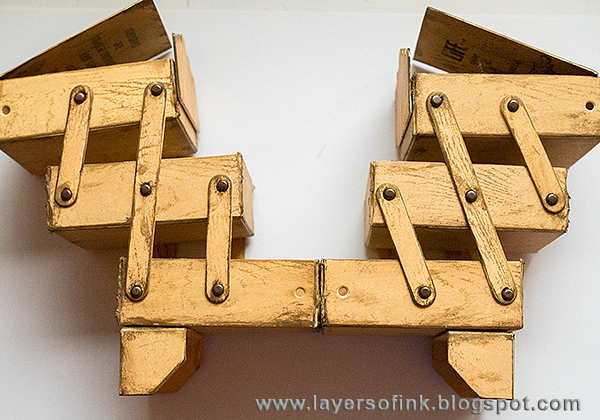 I glued my extra decorative handle to the top of each box, as shown. Glue the two bottom drawers together. Here you can see what the box looks like so far. I wanted to be able to close the lids a little better and die cut the flap of the lids twice. If you look at the lid, this is the part that is glued to the top drawer, so it fits perfectly. Only this time, we will glue it to the lid itself. Glue to the lid, to form a closure, so that the lid doesn't remain open. 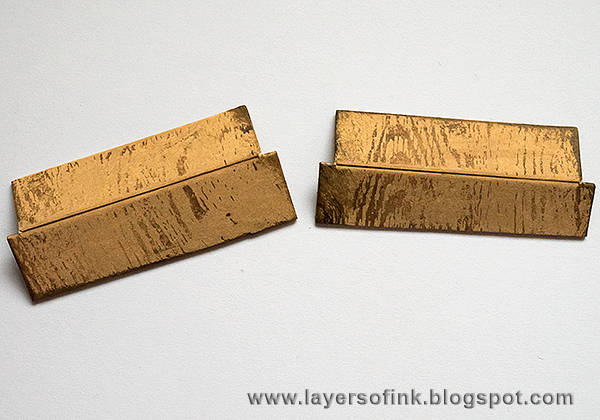 As you can see, I by mistake covered up some of the stamping, since I had not originally planned to use these closure flaps. 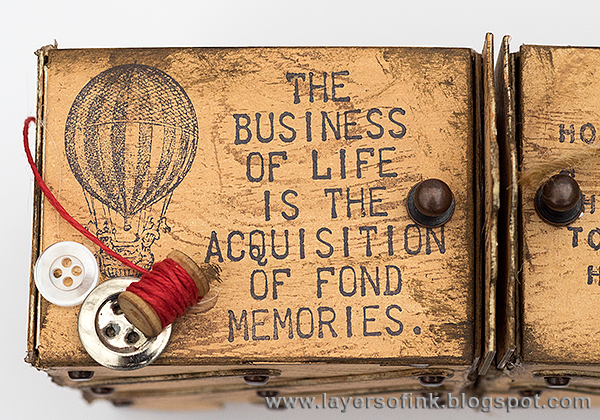 I will just restamp the first word ('memories'). 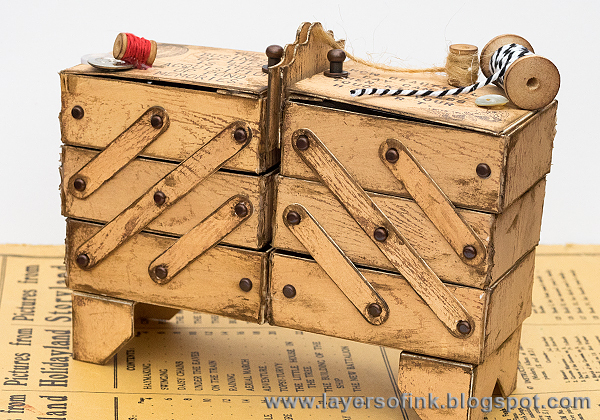 And here is the finished sewing box. 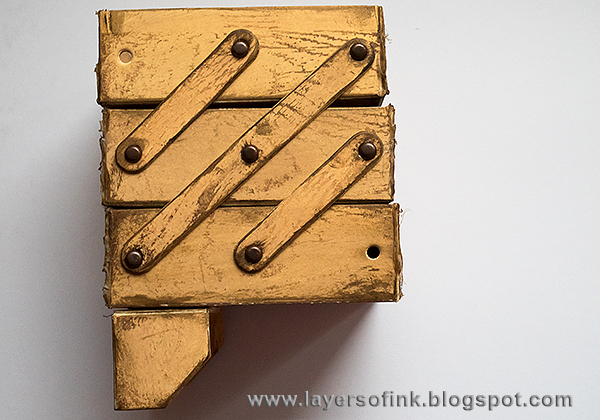 There are four holes on each side which don't have bars attached to them, and I simply placed brads there. 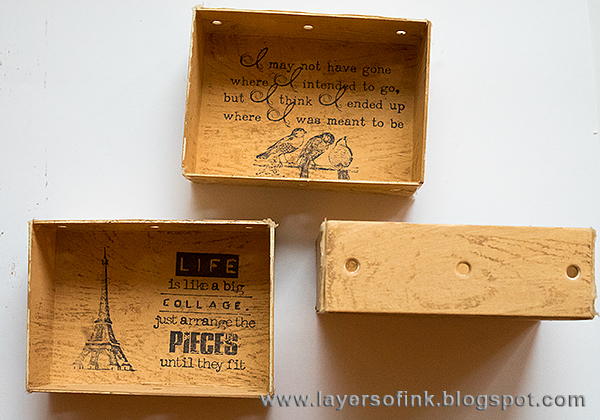 At the top of the box, you'll find more sentiments and stamped images. I should have stamped the sentiment more to the right, since I later decided to add a hitch fastener to make it easier to open the top drawer. 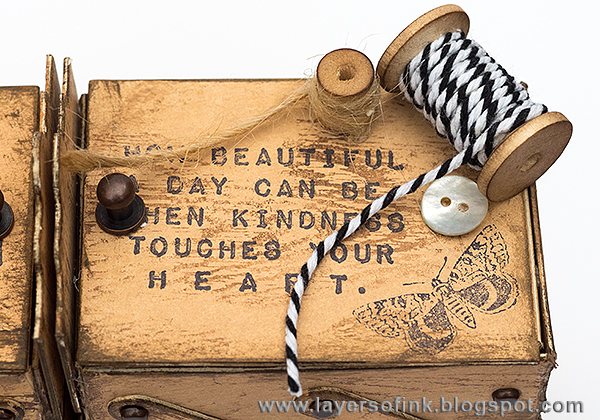 Small bobbins were inked with Ground Espresso and I wound some twine around them. The buttons on the top of the box were in my vintage box. 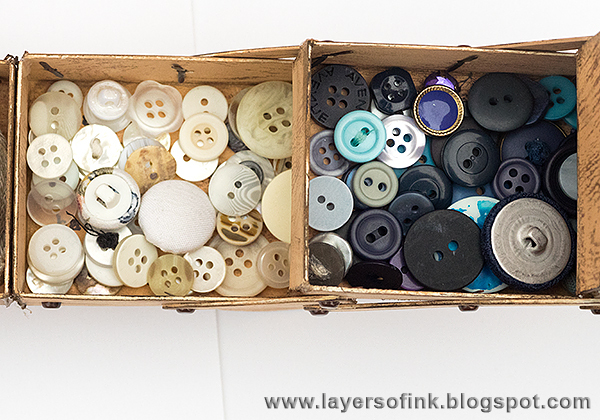 I liked to collect buttons already as a child. The box can be opened half-way like this, or all the way. Here you can see it opened all the way, making it long and a little hard to photograph. I love the look of these bars and they look so much like the real thing. 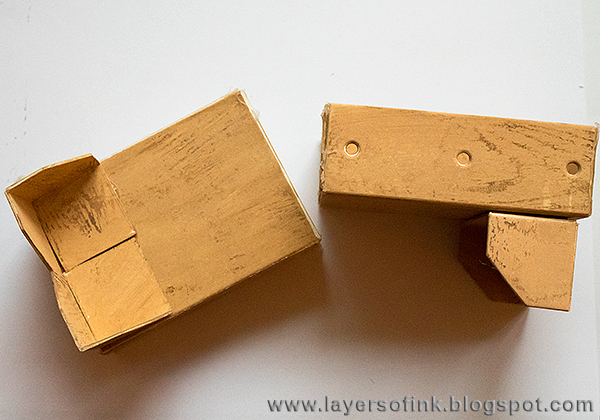 The construction of this die is really cool. 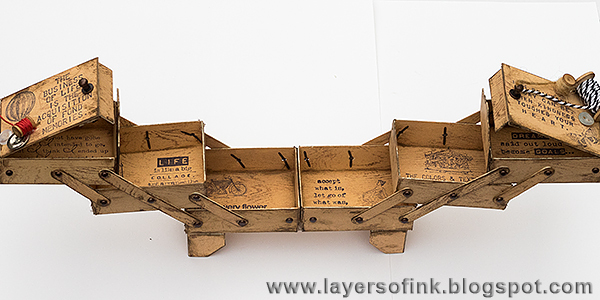 You can use this box to store all kinds of supplies in, as long as they are not too large. The mat board makes the box very sturdy. 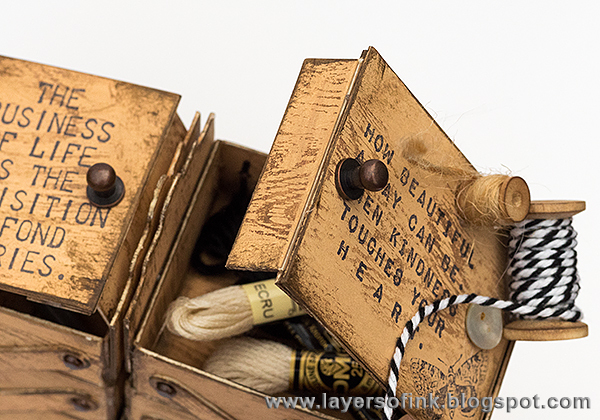 I filled the box with embroidery floss, buttons, ribbons, thread, safety pins and more. These are some of my vintage buttons. More little items. I keep losing the black and white threads to my sewing machine, I am going to keep them in here from now on - as you can see, the black one is still hiding somewhere on my desk. 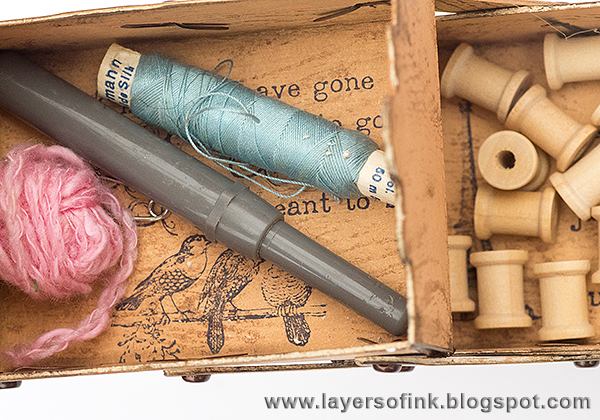 All the items in this drawer were in my original sewing box (I am putting them back there again). 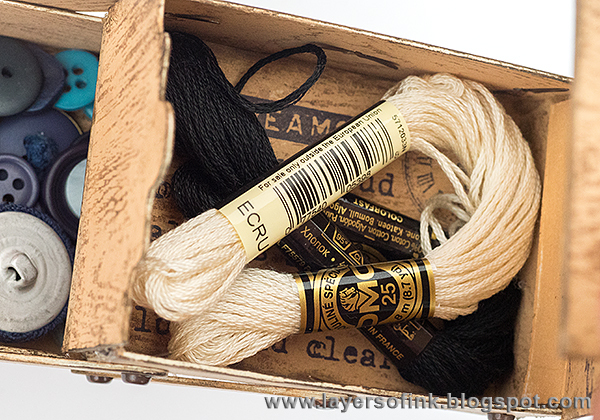 Embroidery floss, this cream one is my favourite to use on projects. 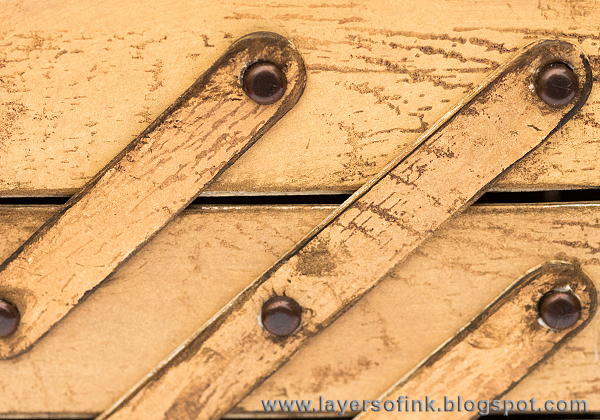 From above, the Cantilever Sewing Box looks like this. It would be a great gift for a friend who likes to sew. I was going to take a photo of the sewing box open where you could see the items I placed in all the drawers at the same time, but when I was busy, a strong gust of wind came and blew everything to the (very wet) ground. I think there might still be some buttons outside our door. I hope you enjoyed this tutorial! 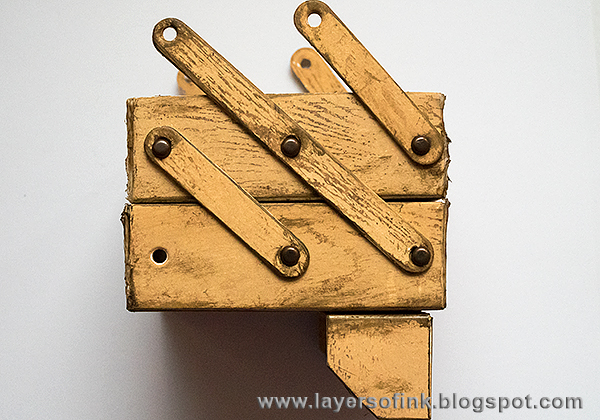 If you don't want to make a sewing box, you can use the faux wood technique on another project.